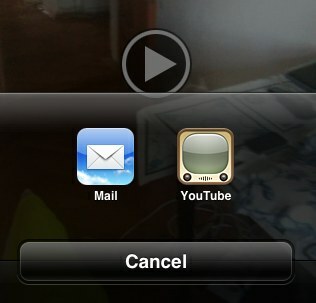 Starting with iOS 6 beta 4, the YouTube app is no longer bundled with Apple's mobile operating system. Apple "said Monday that its license for YouTube has expired, meaning the app will no longer be included in the next version of its mobile operating system, iOS 6. That version is expected to be released to the public this fall and developers are already using it," reports The Wall Street Journal. Back in 2007, when Apple launched the iPhone, YouTube's video player required Flash, so YouTube videos couldn't be played without a special application. YouTube, which was acquired by Google in 2006, transcoded some of the videos to H.264 and allowed Apple to build a native YouTube application. "To achieve higher video quality and longer battery life on mobile devices, YouTube has begun encoding their videos in the advanced H.264 format, and iPhone will be the first mobile device to use the H.264-encoded videos. Over 10,000 videos will be available on June 29, and YouTube will be adding more each week until their full catalog of videos is available in the H.264 format this fall," mentioned a press release from 2007. The app is no longer that useful, now that YouTube's mobile site has a great interface and more features than the native app. YouTube's HTML5 video player lets you play videos from Safari or any other browser, so many iPhone users don't even use the YouTube app. Just like the Maps application, the YouTube app was neglected by Apple, which didn't add many useful features. Google has constantly improved the YouTube app for Android and now will also develop a YouTube app for iOS. Maybe Apple wanted to release a Google-free version of the iOS and the next step could be switching to Bing as the default search engine in Safari, but things are not that bad for Google. After all, YouTube is the most popular video sharing site and Google Maps is the most popular online mapping service. Google can develop its own apps, update them more often and add new features. Even if YouTube's mobile site can replace the native app, there are two features that couldn't be added by YouTube: uploading videos and supporting the old embedding code. The good news is that both features are available in iOS 6 beta 4 and it's likely that the final version will continue to include them. Not really a huge thing this. Both parties should gain from this, except the users. In a YouTube app from Google, there is going to be ads. As a iPhone user I am more concerned about Google+ and the lack of intergration in iOS. If Google create a more userfriendly login-page, add more depth to profiles so you could add interest, music etc it could really be something. This is the real hurdle for Google to overcome that will bring in followers. I love Facebook timeline idea but sloppy implementation. A timeline should be populated by other things like news about "liked items". Ex a tv-show ends, a favourite artist release an album, loveable items from friends and family. Ex a cousin or friend has a baby. There should also be big news that impact ones lives like death of famous people, presedential elections etc. Then you can first and foremost understand a timeline of someones lifes. I love books that compile entire years - like this happened in 1994. Facebook is doing one thing right and that is seperating applications so that each app isnt bloated. Facebook Camera looks awesome but isnt available in my country. Sometimes all you want to see is pictures. Facebook messenger is gaining popularity. Google should follow this trend. Google should also add something similar to Facebook poll/questions on the web. It´s great but bad implimentation. A question should be fixed to the side of the feed and not subject to move. Lastly I would like to see Google drive add better controls of sorting and viewing images on the web. I would love a slideshow feature. The Google drive app should allow you to add items from the app. Some random ideas from a Google+ fan. I have read the information which you have shared here and i think apple's going to launch some other option instead of YouTube. I am looking and waiting for that as i am using iPhone 4s. Google should buy Path, Brewster, Shoebox and Luminiance app. Apple have confirmed that leaving YouTube’s app out of their beta demonstrations of iOS 6 was an intentional move, as they confirmed that Google’s licence to provide default apps on the products is now officially expired. Apple using Bing as a default search? Heavens no. Apple my not like Eric, but I'm sure they'd hate Steve Ballmer even more. ohoo thats soo bad i always use the app for youtube it will be soo hard now..
YouTube is not the only Google service getting dropped in iOS 6, with Apple already announcing it will replace Google Maps with its own proprietary map application. Maps in iOS 6 will feature 3D city views and Siri-enabled turn-by-turn navigation. Apple will launch iOS 6 with the new iPhone, which is said to have a smaller 19-pin connector rather than the current model's 30-pin port, along with the wider 16x9 screen in a longer form factor. Supposed images of the new iPhone were leaked online last week.